Puli Pongal: Pongal is a popular rice dish in South Indian cuisine and Tamil cuisine of Sri Lanka. Puli Pongal (lit. tamarind pongal) is generally prepared in temples as a prasadam, (an offering made to a deity, as a thanksgiving). The main ingredients are broken raw rice and tamarind and often eaten ad breakfast or dinner in Tamil Nadu. Soak Tamarind in hot water for half an hour. Squeeze out the juice three or four times to extract the pulp by adding water as required. Keep the ratio 5:2 for tamarind water to broken rice. Heat the gingelly oil in a non-stick pan on medium heat. Temper the mustard seeds in the hot oil. When the mustard seeds splutter, add in the chana dal and allow the dal to brown a little. Add in the peanuts, red chillies and curry leaves. Add in the tamarind water and allow it to boil. Add in the jiggery and asafoetida and season with salt. When the tamarind water boils, add in the broken raw rice while stirring continuously. Keep stirring continuously till all the water is absorbed, otherwise it might become lumpy. When the water is absorbed, lower the flame; cover and cook for ten minutes. 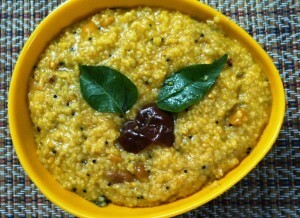 Puli pongal is ready to be served. Serve hot puli pongal with some papdi or mixture for crunchy texture. If you have any queries regarding the Puli Pongal recipe, please leave a comment.